My Panyard is run by a group of volunteers who provide valuable information about the history and culture of the steelpan, mainly within the United Kingdom. 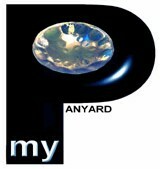 At My Panyard, we hope to enable individuals, organisations and communities interested in pan to gain the necessary skills and confidence to actively support in its development and prominence as a musical instrument. Today the use of technology and the internet is an inevitable fact. In music education, theory, terminology and vocabulary can be measured by means of oral and written tests or by reasoning. It is evident that a large part of music education can only be achieved by practical learning. This can only be measured by means of expression. As a steelpan player, it is customary to learn skills rather than theory. Hence this website represents the building of steelpan competency as well as acknowledging the difference between aptitude and achievement. We cannot replace traditional resources in steelpan teaching, but aim to add to the resources and improve on them.